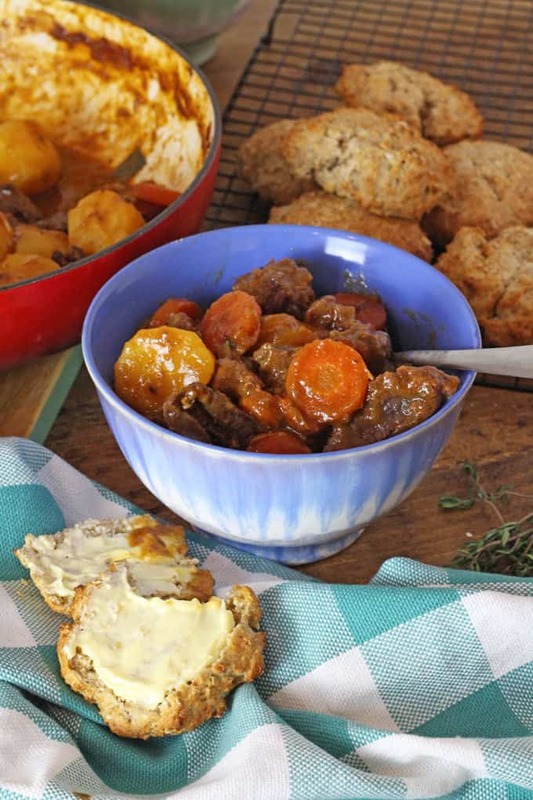 This delicious and warming beef stew is so easy to make. 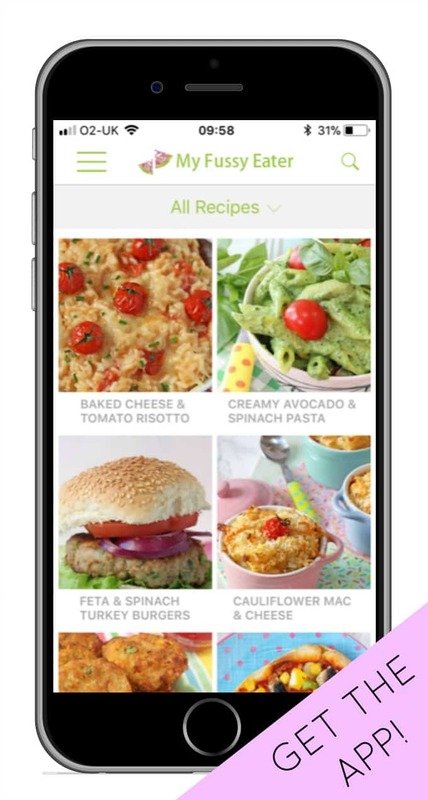 All the ingredients are cooked together in one pan and left to slow cook for an hour. 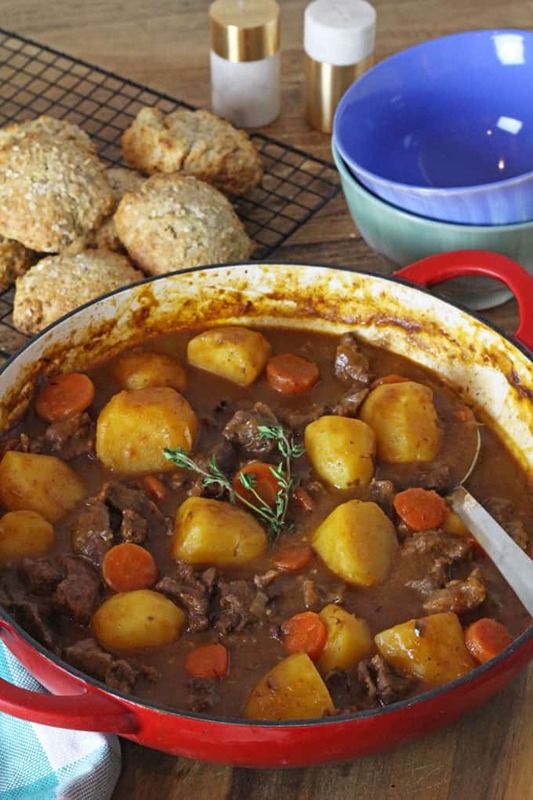 The ultimate comfort food this St Patricks Day! It may officially be Spring but that doesn’t mean that the weather has improved. It’s just as miserable out there as it was in December so I’m still craving all the best comfort foods! 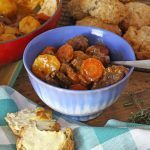 And with St Patrick’s Day just around the corner I thought it would be perfect to share my recipe for one of my favourite weekend meals at the moment… my super easy Irish Beef Stew! Growing up in Ireland I ate a lot of stews as a child. I distinctly remember not enjoying them very much but these days I can’t get enough of them! Maybe it’s because they’re so easy to make. I love any recipes where I can chuck all the ingredients into one pot and leave it by itself to slow cook. 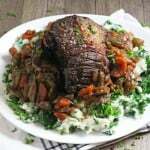 The great thing about this recipe is that you can use a cheaper cut of meat like beef shin but cooking it low and slow for an hour (or even longer if you wish) will make it soft and tender. The recipe makes enough for six servings but you it will keep covered in the fridge for up to 48 hours (great for a leftovers lunch!) or can be frozen too. 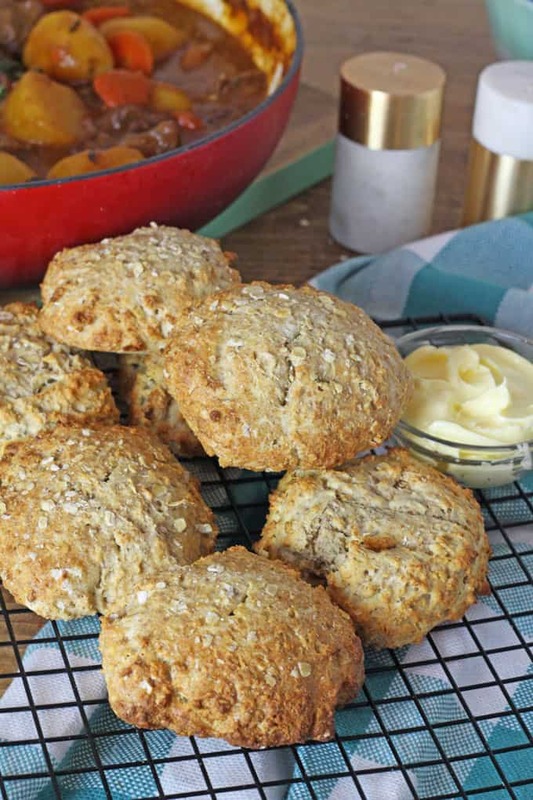 Because the potatoes are cooked within the stew, it is a complete meal by itself but if you want to make dinner extra special then you could whip up some of my Soda Bread Scones to serve alongside it. 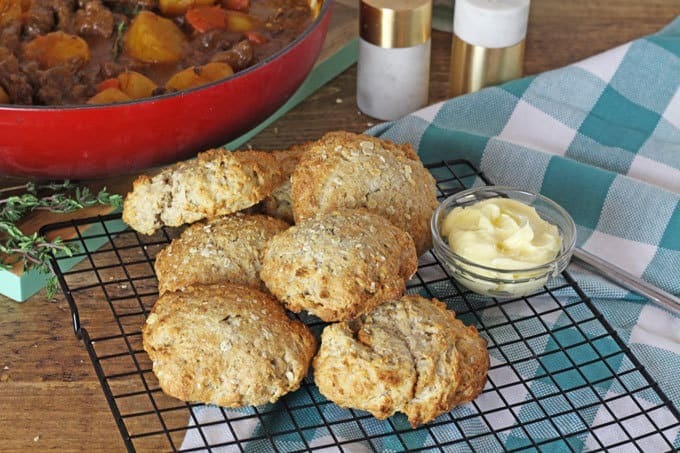 Smeared in butter and dipped into the stew, they really do complete this hearty Irish dish! 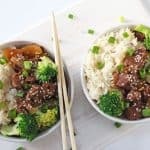 If you try my recipe please come back and let me know what you think in the comments. 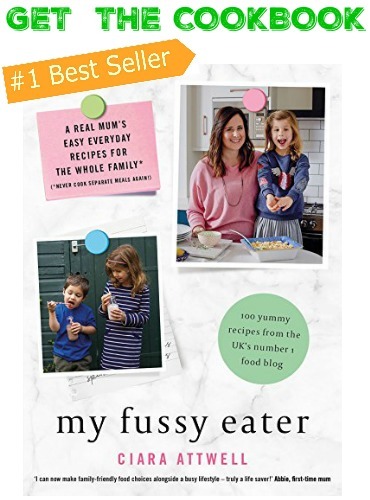 I’ve also been getting so many messages and tags on Instagram from you guys making my recipes. Please keep sending me the pictures. Its always the highlight of my day to see them! 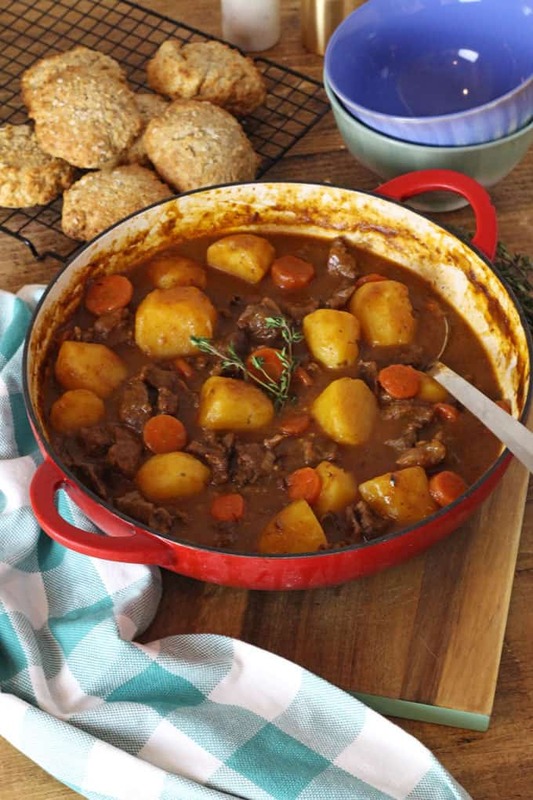 This delicious and warming beef stew is so easy to make. All the ingredients are cooked together in one pan and left to simmer for a couple of hours. Add the diced beef shin and the flour to a large sandwich bag, close the top and then shake the beef around until it has been coated in all the flour. Heat the oil in a casserole dish or large shallow pan. Add the onions and cook for 2-3 minutes until soft. Add the garlic and cook for another minute. Remove the onions and garlic from the pan with a slotted spoon into a bowl. Add the flour coated beef to the pan. You can add more oil at this stage if you think it is needed. Fry the beef for 3-4 minutes until it has browned on all sides. Add back in the onions and garlic along with the rest of the ingredients. If you can’t fit all the stock in the pan at this stage just add as much as you can. As the stock reduces you can add more. Bring to the boil and then reduce to a low simmer. Cover loosely with a lid and leave to simmer for 1 hour, stirring a few times. After 1 hour remove the lid and continue to simmer for another hour, stirring every so often. 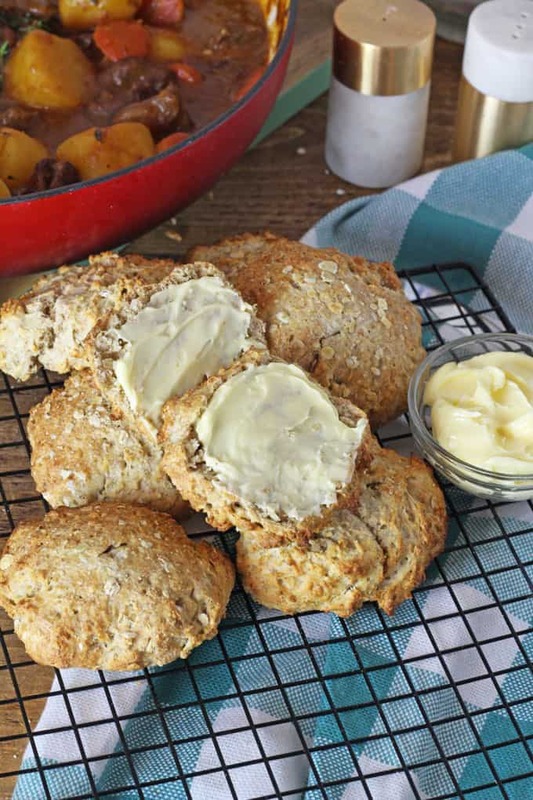 Serve immediately with Soda Bread Scones. Leftovers can be kept covered in the fridge for up to 48 hours or frozen and left at room temperature or in the fridge to defrost. How could you cook this in a slow cooker? So comforting! 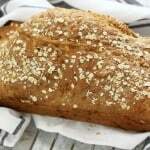 It was just perfect on a cold winter evening and the recipe was really easy to follow as well. 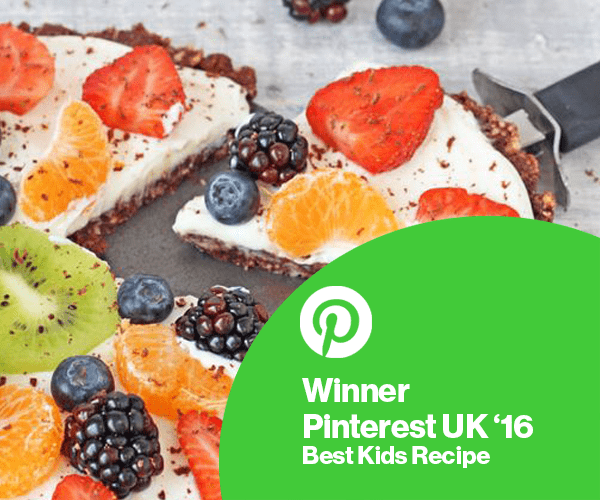 A new family winter favourite! Yes you could. I would add less liquid though. Just made this in the slow cooker. Reduced stock by half and just stuck everything in the cooker on low for 8 hours. Delicious!